Number of shares of Legacy Education Alliance, Inc. Common Stock, $0.0001 par value, outstanding as of August 10, 2016: 21,845,927. Some of the statements in this Quarterly Report on Form 10-Q under the headings “Condensed Consolidated Financial Statements” and “Management’s Discussion and Analysis of Financial Condition and Results of Operations” and elsewhere contain forward-looking statements within the meaning of the Private Securities Litigation Reform Act of 1995. We may also make written or oral forward-looking statements in our periodic reports on Forms 10-K, 10-Q and 8-K, in press releases and other written materials and in oral statements made by our officers, directors or employees to third parties. Statements that are not historical facts, including statements about our beliefs and expectations, are forward-looking statements. Forward-looking statements are often characterized by the use of words such as “believes,” “estimates,” “expects,” “projects,” “may,” “intends,” “plans” or “anticipates,” or by discussions of strategy, plans or intentions; including, but not limited to, our discussions regarding the introduction of additional brands into the U.S. market (e.g., The Independent Woman, Women in Wealth, Brick Buy Brick, and Elite Business Star™ ) which are expected to grow and diversify our U.S. revenue; the development of online courses which are expected to add significant revenue growth; projections of strong international growth, particularly in SE Asia; expected cost savings from symposium fulfillment experience that should lead to increased margins; shortening of course package contracts that should accelerate revenue recognition; and the estimates and matters described under the caption “Item 2. Management's Discussion and Analysis-Results of Operations-Recent Developments” and “Item 2. Management's Discussion and Analysis-Results of Operations-Outlook”. Our assumptions used for the purposes of the forward-looking statements represent estimates of future events and are subject to uncertainty as to possible changes in economic, legislative, industry, and other circumstances, including the development, acceptance and sales of our products and our ability to raise additional funding sufficient to implement our strategy. Such forward-looking statements involve assumptions, known and unknown risks, uncertainties, and other important factors that could cause the actual results, performance or our achievements, or industry results, to differ materially from historical results, any future results, or performance or achievements expressed or implied by such forward-looking statements. Further description of these risks and uncertainties and other important factors are set forth in this report, in our latest Annual Report on Form 10-K, including but not limited to “Part II, Item 7. Management’s Discussion and Analysis of Financial Condition and Results of Operations” therein, and in our other filings with the Securities and Exchange Commission. There may be other factors of which we are currently unaware or that we deem immaterial that may cause our actual results to differ materially from the expectations we express in our forward-looking statements. Although we believe the assumptions underlying our forward-looking statements are reasonable, any of these assumptions, and, therefore, also the forward-looking statements based on these assumptions could themselves prove to be inaccurate. The terms “Legacy Education Alliance, Inc.,” the “Company,” “we,” “our,” “us” or "Legacy" as used in this report refer collectively to Legacy Education Alliance, Inc., a Nevada corporation (“Legacy”), the registrant, which was formerly known as Priced In Corp., and, unless the context otherwise requires, together with its wholly-owned subsidiary, Legacy Education Alliance Holdings, Inc., a Colorado corporation, other operating subsidiaries and any predecessor of Legacy Education Alliance Holdings, including Tigrent Inc., a Colorado corporation. Business Description. We are a provider of practical, high-quality, and value-based educational training on the topics of personal finance, entrepreneurship, real estate, and financial markets investing strategies and techniques. Our programs are offered through a variety of formats and channels, including free-preview workshops, basic training classes, symposiums, telephone mentoring, one-on-one mentoring, coaching and e-learning primarily under the Rich Dad® Education brand (“Rich Dad”) which was created in 2006 under license from entities affiliated with Robert Kiyosaki, whose teachings and philosophies are detailed in the book titled, Rich Dad Poor Dad. In addition to Rich Dad, we market our products and services under a variety of brands, including Martin Roberts, The Independent Woman, Women in Wealth and Brick Buy Brick. Our products and services are offered in the United States, Canada, the United Kingdom, and other international markets. Basis of Presentation. The terms “Legacy Education Alliance, Inc.,” the “Company,” “we,” “our,” “us” or "Legacy" as used in this report refer collectively to Legacy Education Alliance, Inc., a Nevada corporation (“Legacy”), the registrant, which was formerly known as Priced In Corp., and, unless the context otherwise requires, together with its wholly-owned subsidiary, Legacy Education Alliance Holdings, Inc., a Colorado corporation, other operating subsidiaries and any predecessor of Legacy Education Alliance Holdings, including Tigrent Inc., a Colorado corporation. The accompanying unaudited condensed consolidated financial statements presented herein are for us and our consolidated subsidiaries, each of which is a wholly-owned subsidiary. The accompanying condensed consolidated balance sheet as of December 31, 2015 was derived from our audited consolidated financial statements and does not include all disclosures required under United States of America generally accepted accounting principles (“U.S. GAAP”), for annual financial statements. All significant intercompany transactions have been eliminated. These interim financial statements should be read in conjunction with the consolidated financial statements included in our Annual Report on Form 10-K for the year ended December 31, 2015 and reflect all normal recurring adjustments that are, in the opinion of management, necessary to present fairly our results of operations and financial position. Amounts reported in our Condensed Consolidated Statements of Operations and Comprehensive Income (Loss) are not necessarily indicative of amounts expected for the respective annual periods or any other interim period. In March 2016, the Financial Accounting Standards Board (“FASB”) issued Accounting Standards Update (“ASU”) No 2016-09 “Compensation – Stock compensation” (Topic 718). The new guidance is intended to simplify some provisions in stock compensation accounting, including the accounting for income taxes, forfeitures, and statutory tax withholding requirements, as well as classification in the statement of cash flows. This standard is effective for fiscal years and interim periods beginning after December 15, 2016. Early adoption is permitted. We expect to adopt this standard when effective, and the impact on our financial statements is not currently estimable. In January 2016, the FASB issued ASU No 2016-01, “Recognition and Measurement of Financial Assets and Financial Liabilities”, Financial Instruments – Overall (Subtopic 825-10). The new guidance is intended to improve the recognition and measurement of financial instruments. This guidance requires that financial assets and financial liabilities must be separately presented by measurement category and form of financial asset on the balance sheet or the accompanying notes to the financial statements. This guidance is effective for fiscal years and interim periods beginning after December 15, 2017. The standard includes a requirement that businesses must report changes in the fair value of their own liabilities in other comprehensive income (loss) instead of earnings, and this is the only provision of the update for which the FASB is permitting early adoption. We expect to adopt this guidance when effective, and do not expect this guidance to have a significant impact on our financial statements. We account for share-based awards under the provisions of ASC 718, “Compensation—Stock Compensation.” Accordingly, share-based compensation cost is measured at the grant date based on the fair value of the award and we expense these costs using the straight-line method over the requisite service period. Share-based compensation expenses were $37.0 thousand and $74.0 thousand for the three and six months ended June 30, 2016, respectively. There was no share-based compensation expense recorded in the three and six months ended June 30, 2015. See Note 6 - Share-Based Compensation, in the Notes to Consolidated Financial Statements for the year ended December 31, 2015, included in our 2015 Annual Report for further discussion. Unvested awards of share-based payments with rights to receive dividends or dividend equivalents, such as our restricted stock awards, are considered to be participating securities, and therefore, the two-class method is used for purposes of calculating EPS. Under the two-class method, a portion of net income is allocated to these participating securities and is excluded from the calculation of EPS allocated to common stock. Our restricted stock awards are subject to forfeiture and restrictions on transfer until vested and have identical voting, income and distribution rights to the unrestricted common shares outstanding. Our weighted average unvested restricted stock awards outstanding were 885,486 for the three and six months ended June 30, 2016. We had no unvested restricted stock awards outstanding for the three and six months ended June 30, 2015. Financial Instruments. Financial instruments consist primarily of cash and cash equivalents, notes receivable, accounts payable, deferred course expenses, accrued expenses, deferred revenue, and debt. U.S. GAAP requires the disclosure of the fair value of financial instruments, including assets and liabilities recognized in the balance sheets. Management believes the carrying value of the other financial instruments recognized on the condensed consolidated balance sheet date, including receivables, payables and accrued liabilities approximate their fair value. As of June 30, 2016 and December 31, 2015, the fair value of the total warrants' derivative liability is $24,443 and $27,266, respectively, and recorded in other accrued expenses in the Condensed Consolidated Balance Sheets. We recognized a loss on the derivative liability of $2,363 for the three months ended June 30, 2016 and a gain on the derivative liability of $2,823 for the six months ended June 30, 2016, which is recorded in other income, net in the Condensed Consolidated Statements of Operations and Comprehensive Income (Loss). Income tax expense was $9.0 thousand and $10.0 thousand for the three months ended June 30, 2016 and 2015, respectively, and $19.0 thousand and $21.0 thousand for the six months ended June 30, 2016 and 2015, respectively. Our effective tax rate was 0.9% and (1.0%) for the three months ended June 30, 2016 and 2015, respectively, and 1.2% and (1.3%) for the six months ended June 30, 2016 and 2015, respectively. Our effective tax rates differed from the U.S. statutory corporate tax rate of 35.0% primarily because of the mix of pre-tax income or loss earned in certain jurisdictions and the change in our valuation allowance. We record a valuation allowance when it is more likely than not that some portion, or all, of the deferred tax assets will not be realized. As of June 30, 2016 and December 31, 2015, a valuation allowance of $6.1 million and $7.2 million, respectively, has been provided against net operating loss carryforwards and other deferred tax assets. We decreased our valuation allowance by $1.1 million for the six months ended June 30, 2016, and there was no material change in our valuation allowance for the six months ended June 30, 2015. As of June 30, 2016 and December 31, 2015, we had total unrecognized tax benefits of $1.7 million, related to foreign and domestic tax positions. Of this amount, the Company estimates that $0.1 million, of the unrecognized tax benefits, if recognized, would impact the effective tax rate. A substantial portion of our liability for uncertain tax benefits is recorded as a reduction of net operating losses and tax credit carryforwards. During the six months ended June 30, 2016 and 2015, we had no material changes in uncertain tax positions. We record interest and penalties related to unrecognized tax benefits within the provision for income taxes. We believe that no current tax positions that have resulted in unrecognized tax benefits will significantly increase or decrease within one year. We file income tax returns in the U.S. federal jurisdiction and in various state and foreign jurisdictions. Cash and cash equivalents. We maintain deposits in banks in amounts that might exceed the federal deposit insurance available. Management believes the potential risk of loss on these cash and cash equivalents to be minimal. Cash balances as of June 30, 2016 and December 31, 2015, including foreign subsidiaries, without FDIC coverage were $3.0 million and $3.8 million, respectively. Revenue. A significant portion of our revenue is derived from the Rich Dad brands. Revenue derived from the Rich Dad brands as a percentage of total revenue was 75.5% and 77.0% for the three months ended June 30, 2016 and 2015, respectively, and 74.7% and 80.6% for the six months ended June 30, 2016 and 2015, respectively. In addition, we have operations in the U.S., Canada, the United Kingdom and other foreign markets (see Note 9 — Segment Information). * Segment gross profit is calculated as revenue less direct course expenses, advertising and sales expenses and royalty expense. Licensing agreements. We are committed to pay royalties for the usage of certain brands, as governed by various licensing agreements, including Rich Dad, Robbie Fowler, and Martin Roberts. Total royalty expenses included in our Condensed Consolidated Statements of Operations and Comprehensive Income (Loss) were $1.1 million and $1.6 million for the three months ended June 30, 2016 and 2015, respectively, and $2.1 million and $2.8 million for the six months ended June 30, 2016 and 2015, respectively. Custodial and Counterparty Risk. We are subject to custodial and other potential forms of counterparty risk in respect to a variety of contractual and operational matters. In the course of ongoing Company-wide risk assessment, management monitors our arrangements that involve potential counterparty risk, including the custodial risk associated with amounts prepaid to certain vendors and deposits with credit card and other payment processors. Deposits held by our credit card processors at June 30, 2016 and December 31, 2015, were $3.6 million and $2.9 million, respectively. These balances are included on the Condensed Consolidated Balance Sheets in restricted cash. While these balances reside in major financial institutions, they are only partially covered by federal deposit insurance and are subject to the financial risk of the parties holding these funds. When appropriate, we utilize Certificate of Deposit Account Registry Service (CDARS) to reduce banking risk for a portion of our cash in the United States. A CDAR consists of numerous individual investments, all below the FDIC limits, thus fully insuring that portion of our cash. At June 30, 2016 and December 31, 2015, we did not have a CDAR balance. A substantial settlement payment or judgment in excess of our accruals could have a material adverse effect on our financial position, results of operations or cash flows. While the outcome of these proceedings cannot be predicted with certainty, we do not expect any of these existing matters, individually or in the aggregate, to have a material adverse effect upon our financial position, results of operations or cash flows. There have been no material changes to the legal proceedings disclosed in the litigation section of Note 15 - Commitments and Contingencies, in the Notes to Consolidated Financial Statements for the year ended December 31, 2015, included in our 2015 Annual Report for further discussion. We have evaluated significant events and transactions that occurred after the balance sheet date and determined that there were no events or transactions that would require recognition or disclosure in our condensed consolidated financial statements for the period ended June 30, 2016. The following discussion and analysis of our financial condition and results of operations for the periods indicated should be read in conjunction with our audited consolidated financial statements and related notes thereto included in our Annual Report on Form 10-K as of and for the year ended December 31, 2015. This discussion contains forward-looking statements reflecting our current expectations that involve risks and uncertainties. Our actual results and the timing of events may differ materially from those contained in these forward-looking statements due to a number of factors, including those discussed in our most recent Form 10-K, and elsewhere in this Form 10-Q. We are a provider of practical, high-quality, and value-based educational training on the topics of personal finance, entrepreneurship, real estate and financial markets investing strategies and techniques. Our programs are offered through a variety of formats and channels, including free-preview workshops, basic training classes, symposiums, telephone mentoring, one-on-one mentoring, coaching and e-learning, primarily under the Rich Dad® Education brand (“Rich Dad”) which was created in 2006 under license from entities affiliated with Robert Kiyosaki, whose teachings and philosophies are detailed in the book titled, Rich Dad Poor Dad. In addition to Rich Dad, we market our products and services under a variety of brands, including Martin Roberts, The Independent Woman, Women in Wealth and Brick Buy Brick. Our products and services are offered in the United States, Canada, the United Kingdom, and other international markets. Our students pay for their courses in full up-front or through payment agreements with independent third parties, and under United States of America generally accepted accounting principles (“U.S. GAAP”), we recognize revenue when our students take their courses or the term for taking their course expires, which could be several quarters after the student purchases a program and pays their fee. Over time, we have taken steps to shorten many of our course contracts from two-year contracts to one-year contracts, which is expected to accelerate revenue recognition as services are delivered faster and/or contract terms expire sooner. We also continue to expand our innovative symposium-style course delivery model into other markets. Our symposiums combine multiple advanced training courses in one location, allowing us to achieve certain economies of scale that reduce costs and improve margins while also accelerating U.S. GAAP revenue recognition, while at the same time, enhancing our student's experience, particularly, for example, through the opportunity to network with other students. We also provide a richer experience for our students through one-on-one mentoring (two to four days in length, on site or remotely) and telephone mentoring (10 to 16 weekly one-on-one or one-on-many telephone sessions). Mentoring involves a subject matter expert visiting the student in person and guiding the student, for example, through his or her first real estate transaction, providing a real hands-on experience. We manage our business in four segments based on geographic location. These segments include our historical core markets of the United States, Canada, and the United Kingdom, with the fourth segment including all other international markets. In 2014, we expanded our footprint to include Africa, Europe, and Asia, holding events in 21 countries. As we have established traction in these markets, we have moved forward on opening offices in South Africa and Hong Kong during the first six months of 2015. Overall, we added an additional five new countries to our footprint in 2015 for a total global reach of 26 countries. We intend to continue to focus on diversifying our sales internationally. ● Rich Dad® Education: Our flagship brand based on the teachings of Robert Kiyosaki, an entrepreneur, investor, educator, and author of the best-selling personal finance book of all time, Rich Dad Poor Dad. Mr. Kiyosaki has written more than 15 books with combined sales of more than 26 million copies. ● Brick Buy Brick™: Initially launched in the UK, Brick Buy Brick is now also available in the U.S. Canada and the other international markets in which we operate. The program introduces our students to the tools and strategies used by successful investors to make money work for them through real estate investing. ● The Independent Woman™: Developed by women for women, based on the teachings and principles of Kim Kiyosaki, investor, entrepreneur, and bestselling author of Rich Woman and It's Rising Time, The Independent Women program imparts the principles and strategies essential for potential financial independence. ● Elite Business Star™: Created in partnership with entrepreneur Kevin Harrington, one of the original Sharks from the television show Shark Tank, Elite Business Star is designed to help individuals grow their business through a variety of business strategies including marketing, asset protection, and business financing. We have introduced several new brands into the U.S. market, including The Independent Woman, Women in Wealth, and Brick Buy Brick, and in January 2016, we announced the launch of the Elite Business Star™ brand. Created in association with entrepreneur Kevin Harrington, one of the original Sharks from the television show Shark Tank, Elite Business Star is designed to help individuals grow their businesses. In February 2016, we announced the signing of former NFL player Phillip Buchanon as a spokesperson for Brick Buy Brick and who has become an Elite Legacy Education student. We believe these new brands will grow our revenue while diversifying our revenue sources. Additionally, our development of online courses is expected to add significant revenue growth going forward. The development of online courses should also reduce expired contracts, as students will have more options for taking their courses, which should accelerate revenue recognition. Overall, countries in SE Asia have reported the fastest growth in e-learning-based education, with this growth rate estimated at approximately 17.0% over the next five years. We continued our expansion internationally which began in 2014, when we expanded our footprint from four countries to 21 countries in Africa, Europe, and Asia, and in 2015, this expansion continued as we added five more countries to our footprint. We opened new offices in South Africa and Hong Kong to facilitate our international expansion. We are also developing courses in entrepreneurship, along with country-specific courses as we expand internationally. These initiatives will likely lead to decreased income in the short term and require a material amount of investment and incurrence of operating expenses. 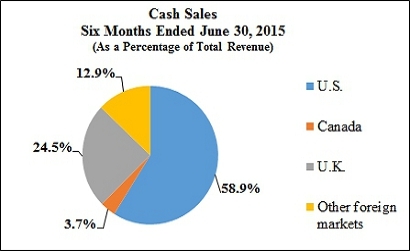 Cash sales were $44.0 million for the six months ended June 30, 2016 compared to $46.4 million for the six months ended June 30, 2015, a decrease of $2.4 million or 5.2%. We believe that cash sales remain an important metric when evaluating our operating performance as revenue recognition under U.S. GAAP occurs when our students attend their courses or the term for taking their course expires, which could be several quarters after the student purchases a program and pays their fee. We anticipate cash sales to increase throughout 2016 and 2017, particularly as new brands gain greater traction in our more established markets, and as we expand internationally and hone our selling and marketing strategy in new markets. Over the past several years, our U.S. business shifted its focus to consist primarily of Rich Dad™ Education brand offerings. Revenue derived from the Rich Dad brands was $12.8 million and $14.0 million or as a percentage of total segment revenue was 87.2% and 95.1% for the three months ended June 30, 2016 and 2015, respectively, and $25.7 million and $28.8 million or as a percentage of total segment revenue was 88.3% and 95.6% for the six months ended June 30, 2016 and 2015, respectively. The majority of this revenue pertained to real estate-related education, with the balance pertaining to financial markets training. We are continuing to develop non-Rich Dad brands, such as The Independent Women, Woman in Wealth, Brick Buy Brick, Elite Business Star™ and others to diversify our business, although our business to date in these brands has not been material to our Company as a whole. U.S. segment revenue was $14.7 million and $14.7 million or as a percentage of total revenue was 62.8% and 64.9% for the three months ended June 30, 2016 and 2015, respectively, and $29.1 million and $30.1 million or as a percentage of total revenue was 63.1% and 67.9% for the six months ended June 30, 2016 and 2015, respectively. 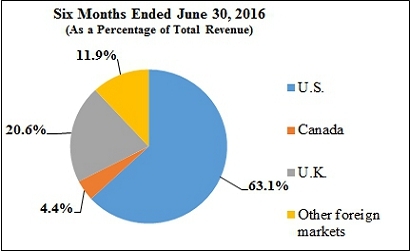 U.S. segment revenue was flat during the three months ended June 30, 2016 compared to the same period in 2015 as the decrease in revenue of $2.4 million or 98.1%, due to the change in our revenue recognition policy with regards to DVD fulfillment, was partially offset by increased attendance (i.e. fulfillment) of $2.2 million or 21.3%. 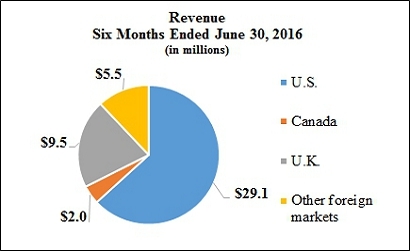 The slight decrease during the six months ended June 30, 2016 compared to the same period in 2015 was primarily due to the decline in recognition of revenue of $4.6 million or 94.5%, due to the change in our revenue recognition policy with regards to DVD fulfillment, partially offset by increased attendance (i.e. fulfillment) of $3.9 million or 19.1% for the six months ended June 30, 2016 compared to the same period in 2015. Similar to the U.S. segment, our Canadian segment's revenue primarily consists of Rich Dad branded offerings. Revenue derived from the Rich Dad brands was $0.7 million and $1.7 million or as a percentage of total segment revenue was 85.5% and 88.0% for the three months ended June 30, 2016 and 2015, respectively, and $1.8 million and $3.0 million or as a percentage of total segment revenue was 87.6% and 90.1% for the six months ended June 30, 2016 and 2015, respectively. The majority of this revenue pertained to real estate-related education, with the balance pertaining to financial markets training. 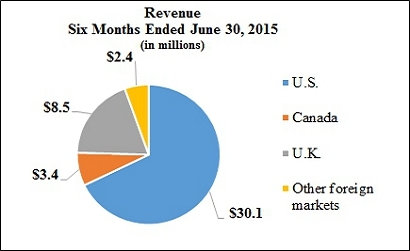 The Canadian segment revenue was $0.8 million and $1.9 million or as a percentage of total revenue was 3.7% and 8.3% for the three months ended June 30, 2016 and 2015, respectively, and $2.0 million and $3.4 million or as a percentage of total revenue was 4.4% and 7.6% for the six months ended June 30, 2016 and 2015, respectively. The decrease in revenue was primarily due to the decline in recognition of revenue from expired contracts of $0.6 million or 98.7% for the three months ended June 30, 2016 and $0.8 million or 71.1% for the six months ended June 30, 2016 compared to the same periods in 2015. In contrast to our U.S. and Canadian segments, our U.K. segment is more diversified among several different brands. Revenue derived from the Rich Dad brands was $1.5 million and $1.8 million or as a percentage of total segment revenue was 34.0% and 40.9% for the three months ended June 30, 2016 and 2015, respectively, and $3.3 million and $3.7 million or as a percentage of total segment revenue was 34.2% and 43.8% for the six months ended June 30, 2016 and 2015, respectively. The majority of this revenue pertained to real estate-related education, with the balance pertaining to financial markets training. 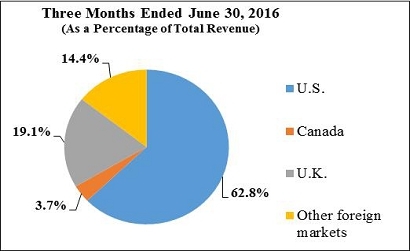 The U.K. segment revenue was $4.5 million and $4.4 million or as a percentage of total revenue was 19.1% and 19.4% for the three months ended June 30, 2016 and 2015, respectively, and $9.5 million and $8.5 million or as a percentage of total revenue was 20.6% and 19.0% for the six months ended June 30, 2016 and 2015, respectively. The increase in revenue for the three months ended June 30, 2016 compared to the same period in 2015 was primarily due to increased attendance (i.e. fulfillment) of $1.0 million or 28.9%, partially offset by the decline in recognition of revenue from expired contracts of $0.6 million or 99.0% and by the decline in recognition of revenue of $0.3 million or 104.0%, due to the change in our revenue recognition policy with regards to DVD fulfillment. The increase in revenue for the six months ended June 30, 2016 compared to the same period in 2015 was primarily due to increased attendance (i.e. fulfillment) of $0.9 million or 13.2%. We operate in other foreign markets, including European, Asian and African countries. Our Other Foreign Markets segment is gaining traction and has shown significant growth in revenue. Revenue derived from the Rich Dad brands was $2.6 million and $0.0 million or as a percentage of total segment revenue was 76.5% and 0.0% for the three months ended June 30, 2016 and 2015, respectively, and $3.7 million and $0.2 million or as a percentage of total segment revenue was 68.1% and 9.4% for the six months ended June 30, 2016 and 2015, respectively. 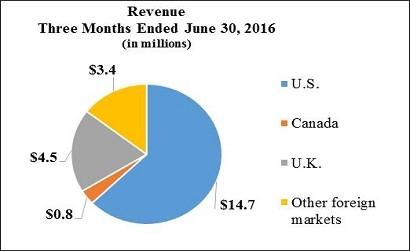 The Other Foreign Markets segment revenue was $3.4 million and $1.6 million or as a percentage of total revenue was 14.4% and 7.4% for the three months ended June 30, 2016 and 2015, respectively, and $5.5 million and $2.4 million or as a percentage of total revenue was 11.9% and 5.5% for the six months ended June 30, 2016 and 2015, respectively. The increase was primarily due to increased attendance (i.e. fulfillment) of $1.7 million or 99.8% for the three months ended June 30, 2016 compared to the same period in 2015, and $3.0 million or 121.7% for the six months ended June 30, 2016 compared to the same period in 2015. Revenue was $23.4 million for the three months ended June 30, 2016 compared to $22.6 million for the three months ended June 30, 2015, an increase of $0.8 million or 3.5%. The increase was due to increased attendance (i.e. fulfillment) of $4.4 million or 26.1%, partially offset by the decrease in recognition of revenue from expired contracts of $0.9 million or 31.2% and the decline in recognition of revenue of $2.7 million or 98.8%, due to the change in our revenue recognition policy with regards to DVD fulfillment. 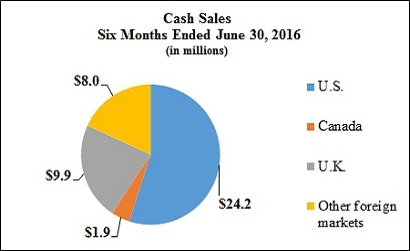 Cash sales were $22.7 million for the three months ended June 30, 2016 compared to $23.7 million for the three months ended June 30, 2015, a decrease of $1.0 million or 4.4%. Total operating costs and expenses were $22.7 million for the three months ended June 30, 2016 compared to $23.8 million for the three months ended June 30, 2015, a decrease of $1.1 million or 4.6%. The decrease was primarily due to a $0.6 million decrease in royalty expense, a $0.6 million decrease in general and administrative expenses and a $0.1 million decrease in advertising and sales expenses, partially offset by a $0.2 million increase in direct course expenses. Direct course expenses relate to our free preview workshops, basic training and advanced training, and consist of instructor fees, facility costs, salaries, commissions and fees associated with our field representatives and related travel expenses. Direct course expenses were $12.6 million for the three months ended June 30, 2016 compared to $12.4 million for the three months ended June 30, 2015, an increase of $0.2 million or 1.6%, which was primarily related to our international expansion initiative. We generally obtain most of our potential customers through internet-based advertising. The trend of increasing online advertising and reducing direct mail and radio advertising continued during the three months ended June 30, 2016 compared to the three months ended June 30, 2015, as we believe it is a more cost-efficient method of attracting potential customers. Advertising and sales expenses consist of purchased media to generate registrations to our free preview workshops and costs associated with supporting customer recruitment. We obtain the majority of our customers through free preview workshops. These preview workshops are offered in various metropolitan areas in the U.S., the United Kingdom, Canada, and other international markets. Prior to the actual workshop, we spend a significant amount of money in the form of advertising through various media channels. Advertising and sales expenses were $5.3 million for the three months ended June 30, 2016 compared to $5.4 million for the three months ended June 30, 2015, a decrease of $0.1 million, or 1.9%. As a percentage of revenue, advertising and sales expenses were 22.7% and 23.9% of revenue for the three months ended June 30, 2016 and 2015, respectively, a decrease of 1.2%. We have licensing and related agreements with RDOC, whereby we have exclusive rights to develop, market, and sell Rich Dad-branded live seminars, training courses, and related products worldwide. In connection with these agreements and our other licensing agreements, we are required to pay royalties. Royalty expenses were $1.0 million for the three months ended June 30, 2016 compared to $1.6 million for the three months ended June 30, 2015, a decrease of $0.6 million, or 37.5%. General and administrative expenses primarily consist of compensation, benefits, insurance, professional fees, facilities expense and travel for the corporate staff, as well as depreciation and amortization expenses. General and administrative expenses were $3.7 million for the three months ended June 30, 2016 compared to $4.3 million for the three months ended June 30, 2015, a decrease of $0.6 million, or 14.0%. The decrease was primarily driven by lower compensation costs. Income tax expense was $9.0 thousand and $10.0 thousand for the three months ended June 30, 2016 and 2015, respectively. Our effective tax rate was 0.9% and (1.0%) for the three months ended June 30, 2016 and 2015, respectively. Our effective tax rates differed from the U.S. statutory corporate tax rate of 35.0% primarily because of the mix of pre-tax income or loss earned in certain jurisdictions and the change in our valuation allowance. See Note 7 Income Taxes, for further information. We record a valuation allowance when it is more likely than not that some portion, or all, of the deferred tax assets will not be realized. As of June 30, 2016 and December 31, 2015, a valuation allowance of $6.1 million and $7.2 million, respectively, has been provided against net operating loss carryforwards and other deferred tax assets. We decreased our valuation allowance by $0.6 million for the three months ended June 30, 2016, and increased our valuation allowance by $0.4 million for the three months ended June 30, 2015. Net income was $1.0 million or $0.05 per basic and $0.04 per diluted common share for the three months ended June 30, 2016, compared to a net loss of ($1.0) million or ($0.05) per basic and diluted common share for the three months ended June 30, 2015, an increase in net income of $2.0 million or $0.10 per basic and $0.9 per diluted common share. Net income for the three months ended June 30, 2016 was positively impacted by the increase in revenue primarily due to increased attendance (i.e. fulfillment) of $4.4 million or 26.1% and decreases in operating costs and expenses of $1.1 million or 4.6%, primarily due to decreases in royalty expenses and general and administrative expenses. Revenue was $46.1 million for the six months ended June 30, 2016 compared to $44.4 million for the six months ended June 30, 2015, an increase of $1.7 million or 3.8%. The increase was due to increased attendance (i.e. fulfillment) of $7.5 million or 23.3%, partially offset by the decline in recognition of revenue of $5.2 million or 93.6%, due to the change in our revenue recognition policy with regards to DVD fulfillment and the decrease in recognition of revenue from expired contracts of $0.6 million or 9.1%. 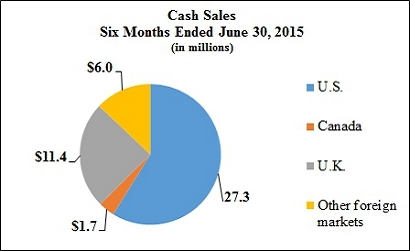 Cash sales were $44.0 million for the six months ended June 30, 2016 compared to $46.4 million for the six months ended June 30, 2015, a decrease of $2.4 million or 5.2%. Total operating costs and expenses were $44.6 million for the six months ended June 30, 2016 compared to $46.2 million for the six months ended June 30, 2015, a decrease of $1.6 million or 3.5%. The decrease was due to a $1.1 million decrease in general and administrative expenses and a $0.7 million decrease in royalty expense, partially offset by a $0.2 million increase in direct course expenses. Direct course expenses relate to our free preview workshops, basic training and advanced training, and consist of instructor fees, facility costs, salaries, commissions and fees associated with our field representatives and related travel expenses. Direct course expenses were $24.2 million for the six months ended June 30, 2016 compared to $24.0 million for the six months ended June 30, 2015, an increase of $0.2 million or 0.8%, which was primarily related to our international expansion initiative. We generally obtain most of our potential customers through internet-based advertising. The trend of increasing online advertising and reducing direct mail and radio advertising continued during the six months ended June 30, 2016 compared to the six months ended June 30, 2015, as we believe it is a more cost-efficient method of attracting potential customers. Advertising and sales expenses consist of purchased media to generate registrations to our free preview workshops and costs associated with supporting customer recruitment. We obtain the majority of our customers through free preview workshops. These preview workshops are offered in various metropolitan areas in the U.S., the United Kingdom, Canada, and other international markets. Prior to the actual workshop, we spend a significant amount of money in the form of advertising through various media channels. Advertising and sales expenses were flat year over year and represented 22.9% and 23.8% for the six months ended June 30, 2016 and 2015, respectively, a decrease of 0.9%. We have licensing and related agreements with RDOC, whereby we have exclusive rights to develop, market, and sell Rich Dad-branded live seminars, training courses, and related products worldwide. In connection with these agreements and our other licensing agreements, we are required to pay royalties. Royalty expenses were $2.1 million for the six months ended June 30, 2016 compared to $2.8 million for the six months ended June 30, 2015, a decrease of $0.7 million, or 25.0%. General and administrative expenses primarily consist of compensation, benefits, insurance, professional fees, facilities expense and travel for the corporate staff, as well as depreciation and amortization expenses. General and administrative expenses were $7.7 million for the six months ended June 30, 2016 compared to $8.8 million for the six months ended June 30, 2015, a decrease of $1.1 million, or 12.5%. The decrease was primarily driven by lower compensation costs. Income tax expense was $19.0 thousand and $21.0 thousand for the six months ended June 30, 2016 and 2015, respectively. Our effective tax rate was 1.2% and (1.3%) for the six months ended June 30, 2016 and 2015, respectively. Our effective tax rates differed from the U.S. statutory corporate tax rate of 35.0% primarily because of the mix of pre-tax income or loss earned in certain jurisdictions and the change in our valuation allowance. See Note 7 Income Taxes, for further information. Net income was $1.6 million or $0.08 per basic and $0.07 per diluted common share for the six months ended June 30, 2016, compared to a net loss of ($1.6) million or ($0.08) per basic and diluted common share for the six months ended June 30, 2015, an increase in net income of $3.2 million or $0.16 per basic and $0.15 per diluted common share. Net income for the six months ended June 30, 2016 was positively impacted by the increase in revenue primarily due to increased attendance (i.e. fulfillment) of $7.5 million or 23.3% and decreases in operating costs and expenses primarily due to decreases in royalty expenses and general and administrative expenses. For a discussion of our critical accounting policies and estimates that require the use of significant estimates and judgments, see “Management’s Discussion and Analysis of Financial Condition and Results of Operations-Critical Accounting Policies” in our Annual Report on Form 10-K for the year ended December 31, 2015. In general, we believe we will experience increased demand for our products and services as global economic conditions continue to slowly improve since the economic recession that began in 2008. We believe that our products and services appeal to those who seek increased financial freedom. If we experience a prolonged decline in demand for our products and services, it could have a material adverse effect on our future operating results. Historically, we have funded our working capital and capital expenditures using cash and cash equivalents on hand. However, given our relatively modest operating cash flows during the past two years combined, we have needed to manage our cash position to ensure the future viability of our business. During 2014, in the U.S., we entered into agreements with third-party financing companies that provide our customers with financing options not previously available to them for the purchase of our products and services. This new source of funds for our customers had a positive impact on both our revenue and operating cash flows and we expect it to continue to have a positive impact on our business going forward. Net cash used in operating activities was $0.6 million in the six months ended June 30, 2016 compared to net cash provided by operating activities of $2.2 million in the six months ended June 30, 2015, representing a period-over-period decrease of $2.8 million. This decrease was primarily the result of a decrease in current liabilities for deferred revenue in 2016 as a result of increased revenue recognition related to the previously-mentioned increase in fulfillment. Net cash used in investing activities totaled $37.0 thousand in the six months ended June 30, 2016 and $59.0 thousand in the six months ended June 30, 2015, representing our purchases of property and equipment. Our consolidated capital structure as of June 30, 2016 and December 31, 2015 was 100.0% equity. 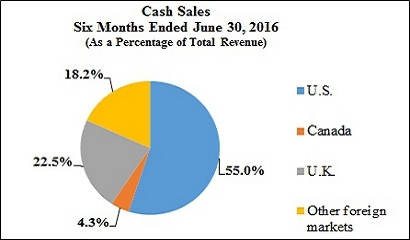 Net cash used in financing activities totaled $5.0 thousand in the six months ended June 30, 2016, compared to net cash provided by financing activities of $454.0 thousand in the six months ended June 30, 2015, representing a period-over-period decrease in cash from financing activities of $459.0 thousand, primarily due to $459.0 thousand of net proceeds we received from a private offering of securities in the six months ended June 30, 2015. We expect that our working capital deficit, which is primarily a result of our significant deferred revenue balance, will continue for the foreseeable future. As of June 30, 2016 and December 31, 2015, our consolidated current deferred revenue was $56.3 million and $60.7 million, respectively. Our cash equivalents were, and continue to be, invested in short-term, liquid, money market funds. Restricted cash balances consisted primarily of funds on deposit with credit card processors and cash collateral with our credit card vendors. Restricted cash balances held by credit card processors are unavailable to us unless we discontinue sale of our products or discontinue the usage of a vendor’s credit card. As sales of the products and services related to our domestic business have decreased, our credit card vendors have not returned funds held as collateral, resulting in higher restricted cash balances. We had no off-balance sheet arrangements as of June 30, 2016. An evaluation of the effectiveness of the design and operation of our disclosure controls and procedures (as defined in Rule 13a-15 under the Securities Exchange Act of 1934) was carried out under the supervision and with the participation of our management, including our Chief Executive Officer (“CEO”) and Chief Financial Officer (“CFO”). As of June 30, 2016, based upon that evaluation, the CEO and CFO concluded that the design and operation of these disclosure controls and procedures were effective. There has been no change in our internal control over financial reporting that occurred during the three months ended June 30, 2016 that has materially affected, or is reasonably likely to materially affect, our internal control over financial reporting. There was no repurchases of the Company's equity securities during the six months ended June 30, 2016. 101* The following materials from Legacy Education Alliance, Inc.’s Quarterly Report on Form 10-Q for the quarter ended June 30, 2016, formatted in XBRL (eXtensible Business Reporting Language): (i) Condensed Consolidated Balance Sheets as of June 30, 2016 and December 31, 2015 (Unaudited), (ii) Condensed Consolidated Statements of Operations and Comprehensive Income (Loss) for the three and six months ended June 30, 2016 and 2015 (Unaudited), (iii) Condensed Consolidated Statement of Changes in Stockholders’ Deficit for the six months ended June 30, 2016 (Unaudited), (iv) Condensed Consolidated Statements of Cash Flows for the six months ended June 30, 2016 and 2015 (Unaudited) and (v) Notes to Condensed Consolidated Financial Statements (Unaudited).